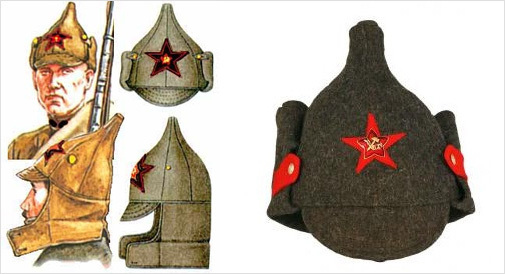 Budenovka is a hat used as the uniform of the Soviet troops from 1918 until 1940. Nobody wears it now but it became an iconic image from the Russian Сivil War. Budenovka got its name from the commander of the First Cavalry division Budenny. The cap is made of wool, it covers ears and neck, its earlaps can be buttoned under the chin. The shape of the hat reminds us of the traditional Russian helmet. It was designed before the Revolution by the Russian artist Viktor Vasnetsov who was inspired by the ancient Russian history and created military headdress that was similar to helmets of the legendary heroes of Russian folklore. The first hats were produced during the World War I but were not officially adopted. Some years later the same hat became the uniform of the Red Army solders. The distinctive symbol of Budyonovka was the star over the visor. The color of the star corresponded to the army division. Thus infantry troops could be identified by the crimson star, cavalry by blue and artillery troops by orange star. A badge with hammer and sickle was in the center of the star. Despite such a short history, Budenovka became a very vivid symbol of the first Soviet state. That’s why we can see it in many films, theater performances and paintings. During your Moscow tour you can find Budenovka on Arbat street or in Izmailovo market.